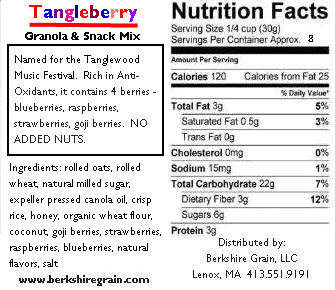 Our Tangleberry Granola gets it's unusual name in reference to our hometown's Tanglewood Music Festival. Rich in antioxidants from 4 berries ~ blueberries, raspberries, strawberries and goji berries. The scent of honey and berries, combine to make this a Berry-licious Granola and Snack Mix. It is Nut-Free. Scroll down for complete product information and additional options. Packaged in resealable 8 ounce pouches FREE SHIPPING is available with a $24.00 Minimum Purchase. Named for the famed Tanglewood Music Festival. Rich in antioxidants from 4 berries ~ blueberries, raspberries, strawberries and goji berries. 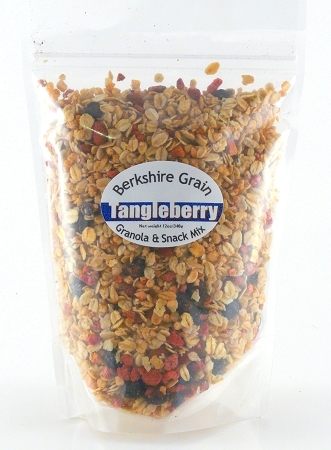 The scent of honey and berries, combine to make this a Berry-licious Granola and Snack Mix. Like all our granolas, which are not only terrific in a bowl with milk or yogurt, fresh fruits and berries. Our granolas are ideal to cook and bake with.